Can I Get More Juice? At times, in life, there are things to explore. They’re like hidden secrets that we persistently insist on not noticing. In Media Buying, this resistance to explore new paths is something we see every day. That’s why I’ve decided to write an article devoted to the unexplored. To the many gold mines inside your campaigns that are hidden out there, waiting for someone brave enough to explore their full potential. In Media Buying, we often see that there are different aspects to be analysed. It could be a really good operating system (OS), device, browser, language, etc. Nevertheless, the key is not only how but when we decide to monetize them on separate campaigns. 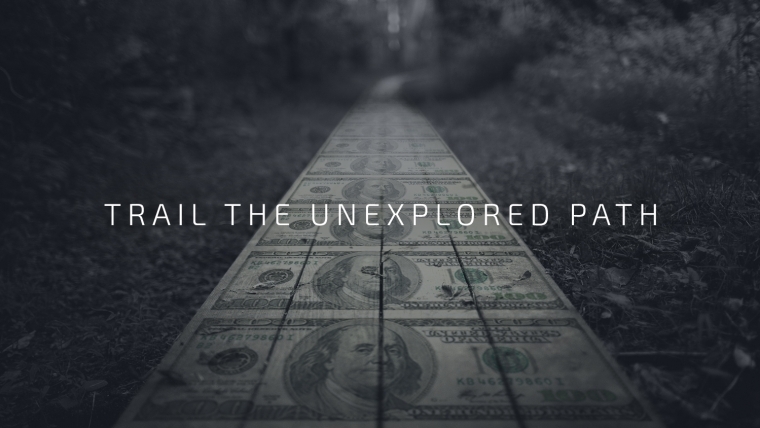 In this post, I’ll take you through the process of finding and optimizing what is usually left unexplored or at least is not explored to the maximum. I’ll use a specific Exoclick campaign as an example in the attempt of making my ideas crystal clear. By following these tips, you’ll get to boost your revenues in no time! Normally, you’ll start by creating a RON (Run of Network) campaign for a specific operator and spot (ex. 300 x 100, 300 x 250). A RON campaign targets all the websites of the Ad Network in a specific spot. Therefore, it allows you to gather data, the importance of which will depend on whether or not you know how to analyse the information displayed. Usually, there’s an amount of time that needs to go by in order for you to garner a considerable volume of data. This period is related to the different countries and each country will present a new situation. For instance, countries with low payouts (revenue per each conversion) and high volumes, such as Thailand, will make this data available to you much faster. On the other hand, countries with higher payouts and less volume, such as Switzerland, will definitely feel like a tougher challenge. You always have to make sure you understand what’s really affecting their performance. Once you do, it becomes easier for you to look for what’s bringing money and if it’s worthwhile to separate it from your RON campaigns. Normally when a specific OS/device/browser is really good, its CPA on ExoClick is much lower than the average payout of the offer that you’re promoting on the RON campaign. Now imagine that – adding to this – you have a considerable amount of conversions. It means you can be close to finding a gold mine! On this tab, you can check an example of a RON campaign with the payout of 1€. 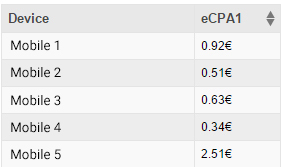 If you analyze it, you’ll see the device 4 has a cost per conversion (eCPA) of 0.34€. This means that you’ll win 0.66€ per each conversion. This particular device I’ve picked is much better than the other devices. Due to the fact that – in comparison – this one not only has a low cost but also a remarkable number of conversions. Low eCPAs can be caused by a low average CPM (cost per one thousand impressions), a high percentage of Click Through Rate (CTR) or both. Having a low average CPM, in most of cases, means you don’t have a strong competition – your eCPA is low simply because you’re paying a penny for it. In my example, device 4 has low costs because of the high percentage of the CTR. I know that my average CPM is similar to all my other devices. Thus, the low eCPA is a result of the number of clicks, and reflects the higher number of conversions for Device 4. This basically lets you know you’re possibly discovering a money making machine! Indeed, device 4 has an eCPM (revenue per 1000 impressions) of around 0.48€, and I’m paying 0.156€ on the current campaign. This means that 0.48€ is the maximum you can afford to pay for this device, at least for now. The next step is to separate this device and put it on a new campaign. When it comes to picking the potential good aspects from your RON, there’s no “right time”. In fact, if there’s such a thing as an intuition, this is when you’ll be asked to use it. This is the part that will define your Media Buying career. It’s the time to use critical reasoning and detailed analysis to ascertain whether or not the eCPA, the number of conversions, and the eCPM are safe enough for you to separate the good aspects of your campaigns. You can even reopen a specific RON campaign later on. To continue exploring new opportunities to make a cash cow! Since you know that your new campaign has a lot of potential, you can secure the first position with a high bid, in order to make sure no one will steal your gold! After securing your position, the next step is maximizing your campaign: calculate your profit margins and – if they’re promising – increase the capping. The goal is simple: to have the new campaign on the first position and the capping disabled. In my example, the RON campaign was initially created for the operator with the best performance. My new gold mine has a good solid targeting, so what more can I do? I’ll open the same target for the second best operator. If it works, I’ll try another one! When you feel you can’t possibly get more juice from your campaign, test other operators with the same target. It’s probable that you’ll be rewarded. Finding these opportunities and later monetizing them can really make a huge difference and ultimately increase your revenues. Once you start doing it, you’ll become addicted!